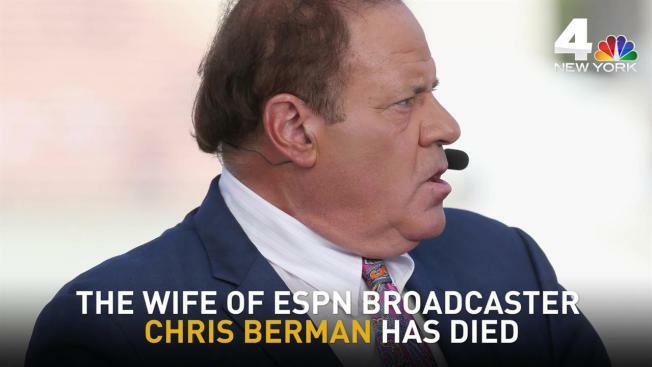 Legendary ESPN broadcaster Chris Berman and his two children are thanking friends, colleagues and sports fans worldwide for the outpouring of love and condolences in the wake of the sudden death of Berman's wife of 30-plus years in a two-vehicle crash in Connecticut earlier this week. In a statement ESPN released on behalf of the family Wednesday afternoon, the Bermans said the support was overwhelming. "Kathy Berman had a huge heart, and this would have warmed hers beyond belief," the statement, signed Meredith, Doug and Chris Berman, said. "It certainly warmed ours." The family also asked supporters to keep the family of Edward Bertulis, the 87-year-old man who also died in the crash, in their thoughts and prayers as well. Police said Bertulis rear-ended 67-year-old Kathy Berman's Lexus as the two drove on Sherman Hill Road in Woodbury Tuesday afternoon. The impact sent Kathy Berman's vehicle veering off the roadway and down a small embankment. It flipped over into a small body of water, authorities say. She died at the scene. Bertulis initially survived the crash -- he collided with a utility pole and his vehicle ended up overturned in the center of the roadway -- but died of his injuries at a hospital. Bertulis' family said at the time of the crash, he was on his way home from the cemetery, where he had gone every day to visit his late wife since she passed away last year. A story on ESPN's website says Chris Berman joined the network in 1979 and married Kathy four years later. He stepped down in January from his role as host of "Sunday NFL Countdown" after 31 seasons, but is still with the network, according to ESPN. Kathy Berman died the day before Chris' 62nd birthday.